The Quantum Composer is an upcoming quantum simulation and visualization tool for education and research. In its core, the composer is a visual scripting language for numerical experiments in quantum mechanics, meaning it is flexible and powerful. When integrated into university courses, its visualization functionality helps multiple learning speed by allowing students to develop intuition instead of learning pure math. Its flexibility will allow the same students to quickly explore new concepts and experiment with different possibilities, breaking the barrier from dry classroom settings into the exciting world of quantum mechanics. Teachers will be able to set questions and tasks using the composer, seamlessly integrating it into any course. In planned expansions the tool will be able to simulate many different kinds of physics and even integrate state-of-the-art quantum optimal control algorithms based on our QEngine, making it a relevant tool for researchers as well as students. The Composer is currently in a pre-release state and being tested with university students at Aarhus University. When a research group at a university develops games, it is natural to ask how these games could potentially benefit not only research but also education. This is especially relevant in quantum mechanics, where visualisation is sparse and intuition is hard to gain. While the goal was not completely clear at the time, a prototype was developed to grant users a visual access to the physics behind Quantum Moves. This quantum simulation tool, as it was prosaically named, was later used successfully in initial quantum mechanics classes at Aarhus University and Roskilde University. Incidentally, it was also used as a level-editor for Quantum Moves. 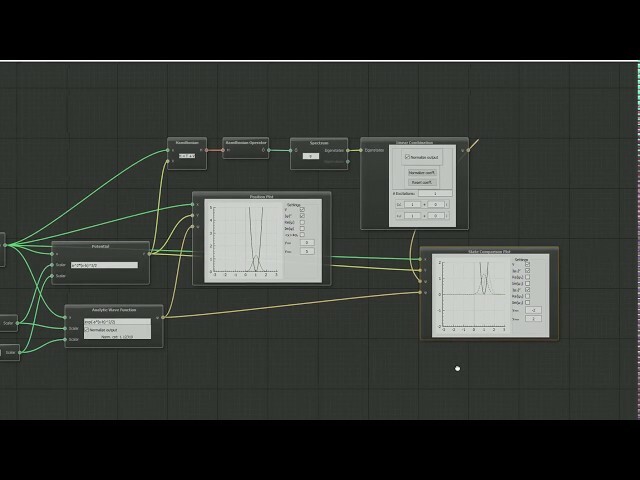 Based on the QSimTool we designed the Quantum Composer in a more modular node-based fashion. 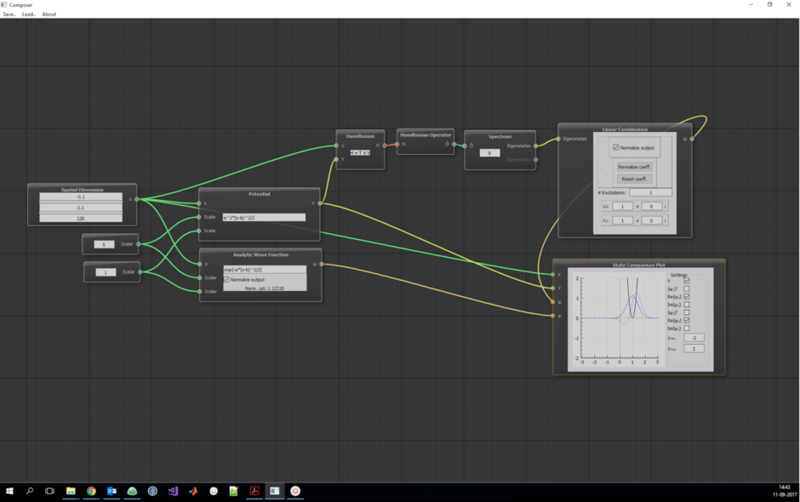 Quantum Composer is still under development and thus a lot of flux is expected in the look and feel of the tool. 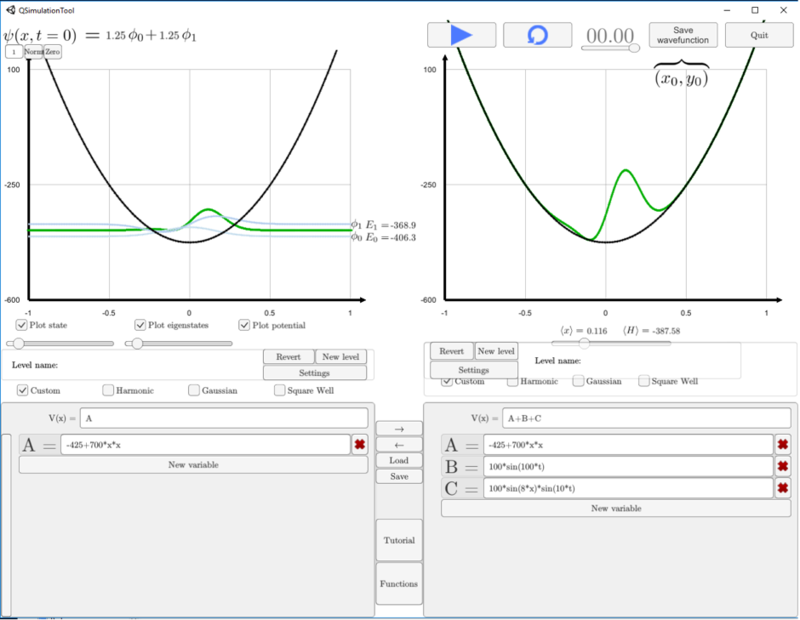 In principle, we wish to make the simulation (and optimization) capabilities of the QEngine available in a graphical fashion, so it can be used in education and by scientists with less programming capabilities. Development is in the early stages, but we have already built a prototype which is being tested with students at Aarhus university. The initial version (expected to be finished sometime in 2018) will be able to simulate the single-particle Schrödinger-equation with arbitrary potentials: finding eigenstates, evolving in time, getting expectation values of observables, and plotting all these results. The node-based interface allows for incredible flexibility, where one can e.g. create eigenstates for one Hamiltonian, evolve them in a different Hamiltonian, and collect the expectation values for a third Hamiltonian. Multiple states can also be simulated and plotted in parallel. This initial version will mostly be targeted at entry-level quantum mechanics courses, but later versions will contain a wide range of Hamiltonians of interest in frontline research, which we can already simulate with the QEngine: Bose-Einstein Condensates (BECs) following the Gross-Pitaevskii-equation, BECs in optical lattices following the Bose-Hubbard-equation, and interacting particles in arbitrary potentials. The educational simulations will also be expanded with e.g. 2-level systems. More loose plans include general quantum optics and quantum computing, although these lie several years in the future. In addition to the raw simulation-capabilities, we will create series of exercises and simulations for use in classroom settings. These exercises will greatly enhance qm-education by allowing students to build an actual intuition around quantum mechanics, in addition to the typical, very math-oriented content. Teachers, students, and researchers will be able to create and share their own exercises and simulations, allowing them to enhance everyone's understanding of quantum mechanics.